Thach weave is one of the oldest air combat tactics, from the era of World War II, first used by US Navy pilots against Japanese pilots. It is developed by John S. Thach of United States Navy, an Accomplished Naval Aviator. It is also called Beam Defence Position or Dutch Rudder tactics. During WWII the Japanese Mitsubishi Zero were giving the US Navy pilots a hard time due to their Superior maneuverability and excellent climb rate, which the American F4F Wildcat didn’t have and often found themselves in a vulnerable position. To counter their tactics US Naval aviator John S. Thach developed a tactics called as Beam Defence Position. 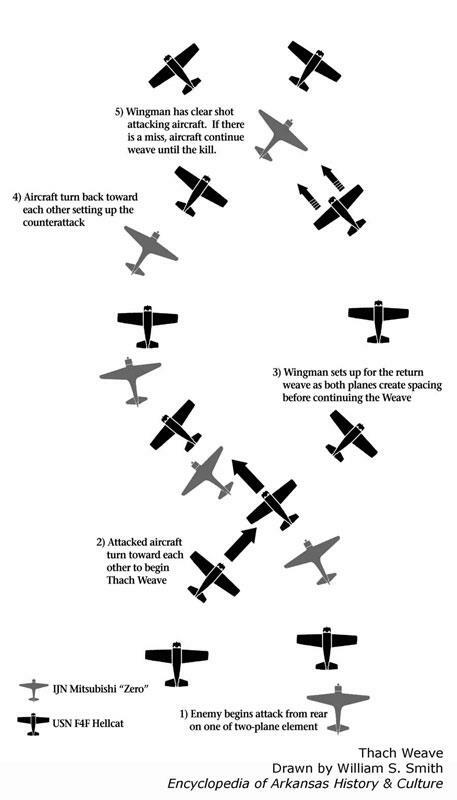 It requires 2 aircraft flying in a visual side-by-side formation. When the enemy aircraft get hot on one aircraft’s tail, both aircraft will bank towards each other…which will result in intersection of their flight path. This will cause the enemy aircraft which is on the tail of one aircraft to be in a vulnerable position for the other aircraft to get a easy kill shot. A perfectly executed Thach Weave is very hard to counter and often results in a successful kill shot. attacked by a Japanese pilot and turned towards Thach, who dived under his wingman and fired at the incoming enemy aircraft’s belly until its engine ignited. Soon this maneuver was so famous that it was adopted by all other pilots from other country. And it is still counted as one of the best air combat maneuvering till date.